Videocon Wallcam talked about its plan for the Eastern region including Kolkata, RoWB, Bihar, Jharkhand, Orissa and NE. According to the brand, Eastern Region will be the fastest growing market in the country in the next 3-4 years. Talking about the market potential, the current Security and Surveillance market size in India is approximately Rs 6600 Cr, of which the Eastern region comprises of only 9% i.e.approx. Rs 600 Cr, despite accounting for a little more than 1/4th of the country’s population. The overall Security and Surveillance market is expected grow 2.5 times by 2021 to reach Rs 15000 Cr, and by this time, the Eastern region will contribute to approximately 15% of the total market i.e. Rs 2300 Cr, which is almost 4 times the current market size. Videocon Wallcam is eyeing 10-12% market share by 2021. 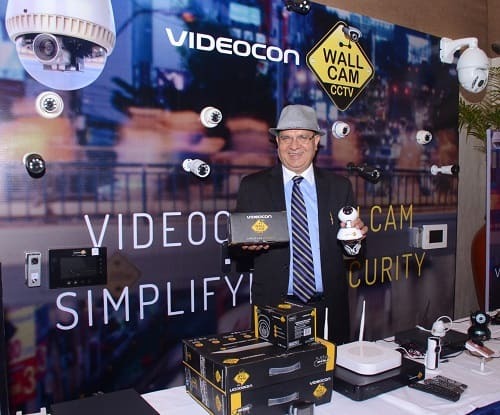 Videocon Wallcam showcased its range of Video Surveillance products including simple plug & play solutions for Retail segment (primarily household & small commercial establishments like shops/office) to high-end and sophisticated products and solutions for Enterprise, Corporate and Government Segment. Among the products displayed for Retail segment were AHD (Analogue high definition) and DVRs (Digital Video Recorders), Video Door Phones, Wireless kits, Cube cams, Car cams, adventure cams in various configurations & specifications. For the Enterprise, Corporate & Government segment, a range of high-end products and solutions were showcased including IP based cameras in upto 8MP resolution, PTZ (Pan, Tilt and Zoom) Cameras, verifocal cameras, high speed dome cameras, Thermal cameras, Vandel proof cameras, Number plate reader camera & solution, Biometric Access control solutions etc. Equipped with features such video analytics including line crossing detection, trespassing alerts, intrusion detection, area entrance & exit, face detection etc., these products and solutions are customizable to the end user’s requirements. As per the brand, AHD (Analogue High Definition) solution is more popular among the Retail segment due to low price and its plug and play convenience, while the IP (Internet protocol) based solution is largely used by Corporate, Enterprise, Govt. and other large commercial establishments like Malls & public places like Airport, Railway stations etc. The brand has a strong Distribution channel in place and is adding more partners in the Eastern region i.e.Kolkata, RoWB, Orissa, Bihar, Jharkhand and NE. The brand also is engaging with system integrators & providing end-to-end solutions to the users. Videocon Wallcam is also already engaged in large Enterprise, Corporate and Govt. projects. Arvind Bali, CEO Videocon Telecom said, “The market dynamics represent a huge opportunity in the Eastern region, and this will be the fastest growing market in the country in by 2021. Eastern market will be our key focus market, and we are set to leverage on the opportunity and are targeting 10-12% market share in the region by 2021. Kolkata will be the hub for eastern states including RoWB, Bihar & Jharkhand, Orissa and NE. “Affordability, quality, innovation and after sales service are the mantras for our brand. Our products will be best when it comes to quality, specifications and features, and yet priced at 15% lower than other brands. We are focusing to make Security and surveillance a way of life for everybody, particularly the household segment.The customer price for Videocon WallCam video surveillance product range starts with as low as Rs 2500/- for a Wireless CubeCam; and a set of four 1MP AHD CCTV cameras and 4 Channel DVR will cost the customer as low as Rs 6500/-, a small price to pay for a lifelong peace of mind.“ added Bali. Videocon Wallcam’s Expansion Plans & Go to Market Strategy for East India 0 out of 5 based on 0 ratings. 0 user reviews.